Amazon, Netflix, Tesla Crash Into Correction Territory -- Now What? 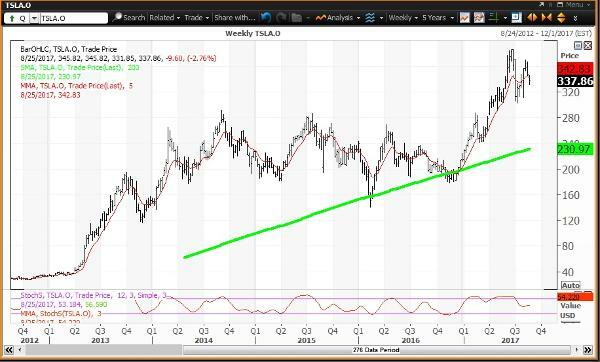 Weekly charts for Amazon and Netflix are negative; Tesla's could be within days. Momentum stocks Amazon (AMZN - Get Report) , Netflix (NFLX - Get Report) and Tesla (TSLA - Get Report) are still in bull market territory vs. their post-election lows. However, all three are in correction territory vs. their post-election highs. So, when they have negative weekly charts, their trading strategies shift from "buy on weakness" to "sell on strength." Amazon closed Monday at $953.29, up 27.1% year to date, in bull market territory 34.2% above its post-election low of $710.10 set on Nov. 14. The stock has a negative weekly chart and is in correction territory 12% below its post-election and all-time intraday high of $1,083.31 set on July 27. Amazon reported disappointing earnings after the close that day. Netflix closed Monday at $166.76, up 34.7% year to date and in bull market territory 50.7% above its post-election low of $110.68 set on Nov. 14. The stock has a negative weekly chart and is in correction territory 12.9% below its post-election and all-time intraday high of $191.50 set on July 21. Netflix gapped higher on July 18 from a close $161.70 on July 17 on a positive reaction to earnings reported after the close that day. The stock became a parabolic bubble that quickly popped. Tesla closes Monday at $337.86, up 58.1% year to date and in bull-market territory 89.6% above its post-election low of $178.19 set on Nov. 14. The stock has a neutral weekly chart that could be downgraded to negative this week. Tesla is in correction territory 12.1% below its post-election and all-time intraday high of $384.25 on June 14, which was a test of my semiannual risky level for the first half of 2017. The stock slumped to as low as $303.13 on July 10. Tesla was in recovery mode when it had a positive reaction to earnings reported after the close on Aug. 2. 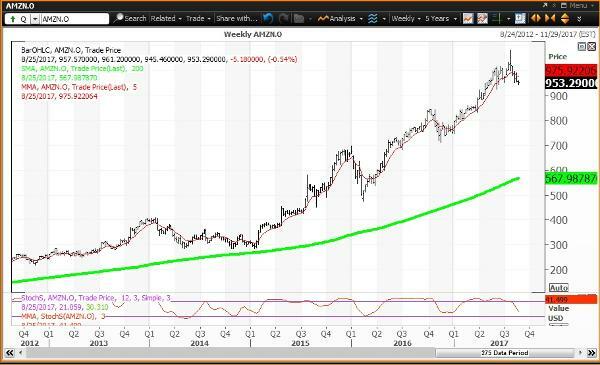 The weekly chart for Amazon ($953.29 on Aug. 21) is negative with the stock below its five-week modified moving average of $975.92. The 200-week simple moving average, or the "reversion to the mean," is $567.99. The 12x3x3 weekly slow stochastic reading is projected to decline to 41.50 this week from 51.72 Aug. 18. Investment strategy: Buy weakness to my semiannual and annual value levels of $857.84 and $753.89, respectively. Sell strength to my weekly, monthly and quarterly risky levels of $966.66, $1,064.56 and $1,100.75, respectively. 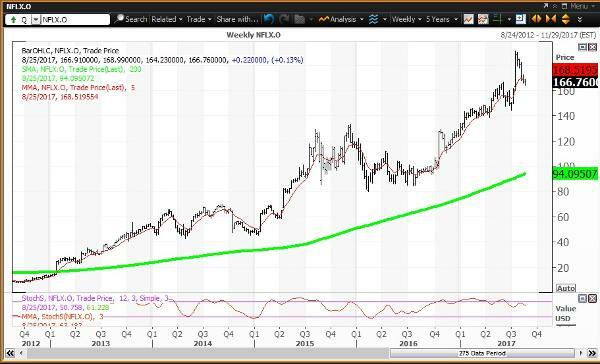 The weekly chart for Netflix ($166.76 on Aug. 21) is negative with the stock below its five-week modified moving average of $168.52. The 200-week simple moving average, or the "reversion to the mean," is $94.10. The 12x3x3 weekly slow stochastic reading is projected to decline to 63.18 this week down from 69.40 on Aug. 18. Investment strategy: Buy weakness to my semiannual and quarterly value levels of $154.76 and $146.22, respectively. My annual value level lags, at $111.17. Sell strength to my weekly and monthly risky levels of $179.32 and $190.21, respectively, which are both below the July 21 high of $191.50. The weekly chart for Tesla ($337.86 on Aug. 21) shifts to negative if the stock ends this week below its five-week modified moving average of $342.83. The 200-week simple moving average, or the "reversion to the mean," is $230.97, last tested during the week of Dec. 16 when the average was $196.77. The 12x3x3 weekly slow stochastic reading is projected to slip to 54.22 this week down from 54.74 on Aug.18. Investment strategy: Buy weakness to my weekly, quarterly and annual value levels of $300.06, $253.90 and $250.95, respectively. Sell strength to my monthly and semiannual risky levels of $401.16 and $422.57, respectively.